IAM Local 733 Bargaining Committee: Front Row, L to R: Chief of Staff to the International President Diane Babineaux, District 70 Directing Business Representative Steve Rooney, Aerospace Coordinator Ron Eldridge, Southern Territory General Vice President Bob Martinez, International President Tom Buffenbarger, Headquarters General Vice President Richard Michalski, District 70 Assistant Directing Business Representative Rita Rogers, LL733 Negotiator Marcus German, LL 733 Negotiator Shaun Junkins, LL 733 Negotiator Sam Humble, LL 733 Negotiator Tim Franta. Back Row, L to R: Southern Territory Communications Representative Bob Wood, LL 733 2nd Shift Plant Chair Joe Kniep, District 70 Secretary-Treasurer Judy Pierce, District 70 Business Representative Becky Ledbetter, District 70 Business Representative Steve Groom, District 70 Business Representative Michael Burleigh, District 70 Business Representative Tony Larkin, Special Representative Mark Love, Strategic Resources Research Associate Andrew Buffenbarger. 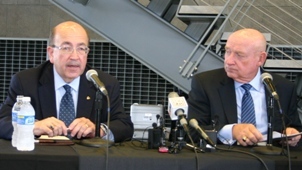 Opening remarks by IAM International President Tom Buffenbarger and Hawker Beechcraft CEO Bill Boisture in Wichita, KS set the stage for the negotiations that will lead to a new contract for 2,600 IAM members at Hawker. Kicking off the negotiations for 2,600 IAM members at Hawker Beechcraft, IAM President Tom Buffenbarger (left) and Hawker Beechcraft CEO Bill Boisture voiced similar concerns about the state of the general aviation industry. Buffenbarger praised the skill and resolve of workers at Hawker in the midst of the industry’s worst downturn in decades. “We’re not afraid to speak out when we’re attacked,” declared Buffenbarger, who noted the IAM’s aggressive defense of the industry in the face of disparaging comments by President Obama and others about the use of business aircraft. Wichita’s largest newspaper, The Wichita Eagle, weighed in with an editorial titled ‘Stop the Jet Bashing.’ The editorial cites New York University law professor Richard A. Epstein, who derided the “cheap political populism” and “primitive economics” of the president’s rhetoric. The general aviation industry supports a $1.2 billion annual payroll and generates an overall economic impact of $150 billion. The proposal to eliminate the depreciation on corporate jets would raise a scant $3 billion in tax revenue over a decade — less than a drop in the bucket of a $14.34 trillion national debt. Opening remarks from President Buffenbarger and CEO Boisture, as well as a Q&A from media are available are available at http://www.youtube.com/watch?v=quhQed334bw.